Knerdy Knitters of the San Fernando Valley is a knitting and fiber arts guild serving Burbank, North Hollywood, Sherman Oaks, Glendale, Studio City, Northridge, Sun Valley, Tarzana, Van Nuys, and other areas of the SFV in Southern California. We promote and support the craft and practice of knitting and other fiber arts in the San Fernando Valley. Fiber lovers of any experience level or age are welcome. We are an active guild with charity knitting, knit-a-longs, workshops, retreats, social events, casual knitting, and more. New knitters are welcome. We will teach you! Other fiber arts crafters are welcome to join us as well. Knerdy Knitters of the San Fernando Valley meets the 4th Monday of every month for its membership meeting. The Knerdy Knitters of the San Fernando Valley held its first meeting on a clear, cold Saturday evening at Panera Bread, 132 Palm Ave., in Burbank. Five women -- Tamala Takahashi, Stacie Rasmussen, Jennifer Schierholt, Sarah Smith and Monica Sottolani -- brought the Knerdy Knitters guild to life that evening. They established the guild's mission, elected officers and set a schedule of meeting for guild business, members, charity knitting and social knitting (Yarn Club). That first year, the guild participated in Warm Up America, which collects seven-inch by nine-inch squares for afghans. The charity project for 2012 was designated the Mother Bear Project to make bears for children with HIV/AIDS worldwide. Today, the guild is passing the 50 member mark and has five monthly meetings -- the guild and membership meeting on the fourth Monday of the month in Burbank; TGIFiber in Porter Ranch on the second Monday of the month; Yarn Club in Burbank on the third Monday of the month; Saturday Stitchers on the Saturday before the first Monday of the month; and our newest event -- Purls & Pooches -- which meets at a pet-friendly outdoor mall in Woodland Hills on the second or third Sunday of the month. 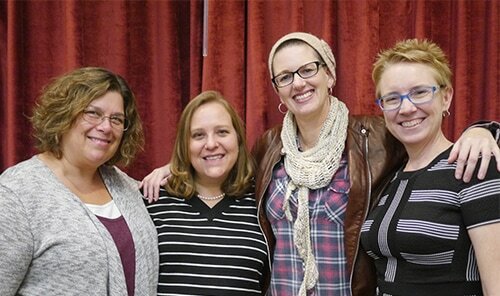 The founders of the Knerdy Knitters of the San Fernando Valley are (from the left) Jennifer Schierholt, Sarah Smith, Stacie Rasmussen and Tamala Takahashi. Not shown is Monica Sottolani. The guild's Bylaws governs its mission, Board of Directors, elections, dues and meetings. The complete bylaws can be downloaded here.